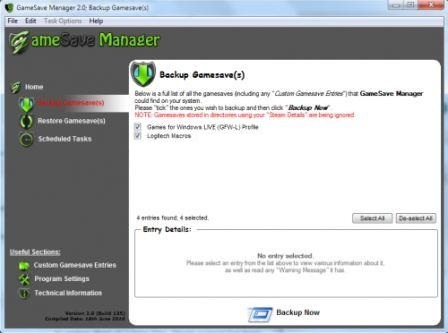 GameSave Manage allows you to backup, restore and transfer your PC gamesaves. ...... paranoid about data loss, etc. * 100% FREE - No catch, no adware, no spyware... Just 100% free. * No dependances - GameSave Manager doesn't need things like .NET Framework installed to run. *Attractive yet easy to use GUI - The GUI (Graphical User Interface) was designed around navigation and ease of use. Ontop of that, it looks quite pretty. * Built-in Update Checker - Completely optional: Check for Program (and Database) updates upon Program Startup. * Regular Database Updates - The "Officially Supported Games" database is forever growing, thus it's always being updated. This database is based upon the community's feedback. * FTP Support - Automatically upload your backups to your own private FTP Server upon their creation. * 7-Zip Support - Enable 7-Zip support for theorecticaly shorter backup times. Qweas is providing links to GameSave Manager 3.0.132 as a courtesy, and makes no representations regarding GameSave Manager or any other applications or any information related thereto. Any questions, complaints or claims regarding this application GameSave Manager 3.0.132 must be directed to the appropriate software vendor. You may click the publisher link of GameSave Manager on the top of this page to get more details about the vendor.